AIGP Assan Kasingye addressing journalists at Naguru Police Headquarters on Monday. Courtesy photo. 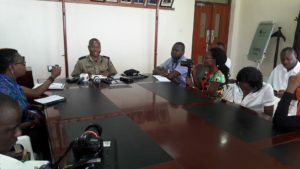 Fed up of the unending strife between rival boda boda factions which now poses a security risk on top of being a major public nuisance in Kampala the police yesterday asked the groups to sit down and sort themselves. “I understand there are contradictions but we shall not look on as the city is turned into a battleground. Why, for example, should boda boda cyclists ride with knives? Police will not tolerate this,” Kasingye said. On Saturday, fighting broke out between rival boda boda operator, paralysing traffic in Wakaliga-Nateete, a Kampala suburb. The bloody fight started when members of Boda Boda 2010 Association led by one Abdul Kitata reportedly raided the offices of Century Riders in Wakaliga. 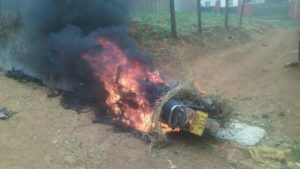 Armed with hoes, sticks and machetes, the boda boda riders were locked in a deadly fight which resulted in numerous injuries and also saw several motorcycles being set ablaze. Police fired live bullets to disperse the warring factions and restore calm. As Kasingye said this morning, it is time to bring an end to this costly conflict. “Boda boda cyclists must sit and resolve their issues without bloodshed. Kampala is better off with an efficient transport system despite different leadership,” Kasingye said. He revealed that the Commander of Kampala Metropolitan Police, Frank Mwesigwa, will meet the rival factions later today. 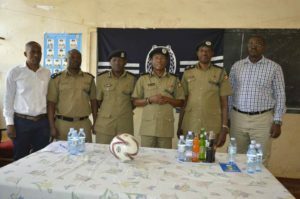 AIGP Assan Kasingye (3rd right) with other police officers shortly before the press conference. Courtesy photo. “We are going to arrest all those responsible for the chaos. You cannot get a knife and stab someone and get away with it,” Kasingye said. He also decried the spate of murder of young women and girls in the Nansana area. “Four women have been killed in Nansana in the recent past. Police has identified their relatives and the bodies have been handed over to them for burial,” Kasingye said. He said nine suspects have been arrested in connection with the gruesome murders. “Girls are given a lot of drinks and lured into bars and lodges from where they are strangled,” he said. Kasingye advised girls and women to avoid walking alone at night or in the company of strangers. “Women should endeavour to walk in groups and they also learn self-defence skills because they are being targeted,” he said. Meanwhile, following the deteriorating discipline and lack of respect for traffic and road safety guidelines by the public, Kampala Metropolitan Police Traffic Commander SSP Norman Musinga has sprung into action. The traffic operation “Tembea salaama” has been resurrected. Musinga said the operation will help clamp-down on rising cases of wrong lane driving, drink driving, indisciplined road users and drivers without valid driving permits, among others. The operation goes hand-in-hand with another police initiative, ‘Operation Fika Salaama’ which is already ongoing on the highways.